To gain more distance is really simple. 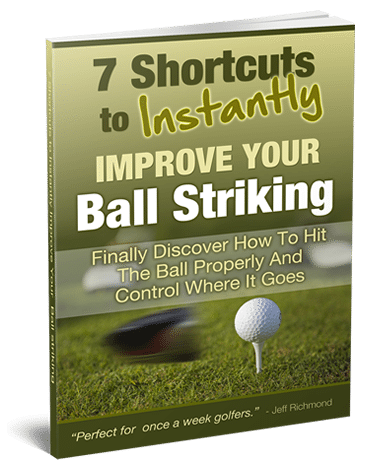 All you need to do is increase the speed that you swing the clubhead on the downswing and through the ball. For example, if you normally swing the club at 80 mph through the ball and you increase that speed to 85 mph the ball is going to travel further, because for every mph you swing faster you’ll pick up about 2.2 yards in distance. So a 5 mph increase in distance equates to 11 yard longer shots. Now this theory sounds very simple and if it’s this simple why doesn’t everyone do this? The answer is that most people try to swing faster in an attempt to hit the ball further but they often find that this doesn’t work. But why doesn’t it work if the theory and logic are sound? no gain in distance or a loss in distance! Which really is ridiculous because the pro’s swing at about 110 – 115 mph on average and golfers swinging about 80 mph say they want to slow down! What you need to do is swing faster while maintaining your balance and timing, but how? Before I tell you how I want to explain when you should be moving the club faster. You want your club to be moving fastest about 2 feet before the ball to about 2 feet after the ball. Now, what most golfers do when they try to swing faster is they swing back faster and that does absolutely no good and destroys both balance and timing. Another common trait is for golfers to start the downswing fast and destroy the balance and then slow down through impact. So now you know what you don’t want to do, how can you increase the speed of your swing just before impact to just after? Here’s a great way to hear what I’m talking about. Grab your driver and turn it up the other way so you’re gripping the shaft up near the head and the grip is down the bottom. Now swing this club with your eyes closed back and forth how you normally would. And listen to the “whoosh” and it should be loudest at the impact position, and keep swinging like this for a good 30 swings, building up a nice rhythm. Remember, do this with your eyes closed so that you are more focused on the sound. Also remember, try to make the “whoosh,” louder at impact than your first 30 swings. Do this by swinging with the same rhythm as you had when you first started but move the club faster through the impact area. At the completion of your swing you should be in perfect balance just as you were with your warm-up swings. Once you’ve got used to this feeling you should now put it into practice, and here’s exactly what you should do. Go out to the practice fairway and be prepared to hit 100 balls. First hit 20 balls with a wedge or a nine iron just concentrating on a nice, smooth rhythm and nothing else. 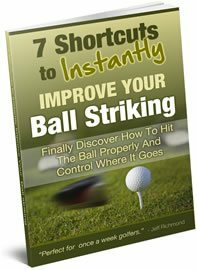 On the 21st ball hit a shot with your driver trying to produce the same smooth swing, and alternate between your driver and 9-iron or wedge for each ball. So hit one shot with your driver and the next one with your wedge or nine iron, and keep doing this for another 20 balls trying to swing with the same rhythm and grace with both clubs. Once you’ve hit 40 balls take a short break and turn the club upside down and swing it back and forth a few times to hear the “whoosh,” and then keeping the same rhythm increase the speed of the swing just before impact so the “whoosh,” is louder. Remember to keep the same smooth rhythm. Now, try to emulate this increase in speed first with your iron and then with your driver and keep alternating between clubs for another 20 balls. Notice the difference in distance, but always be aware of your rhythm. Your rhythm must remain the same, it’s only the speed of the swing at the point just before impact and just beyond that’s faster. Once you’ve finished these 20 balls you’ve only got 40 balls left and this is what I want you to do for the last 40. Hit 5 balls consecutively with your driver concentrating on moving the club faster at the crucial time (just before impact to just beyond), and then hit 5 balls with your wedge or iron hitting shots with your normal paced swing and keep doing this until the 40 balls are all gone. Finish your practice session by hitting some soft wedge shots to restore your natural rhythm. If you’ve done this as I’ve described you would’ve learnt something that few other golfers know, and that’s how to increase distance without swinging like a madman. You’ll have a lot of fun in ripping drives further than before without losing your natural rhythm.